Rama Navami is celebrated with great zeal by Hindus all over the world. It is a festival that celebrates the birth of Lord Rama. Lord Rama, the son of King Dasharath and Queen Kaushalya is regarded as the avatar (incarnation) of Lord Vishnu, one of the supreme Hindu deity. According to the old Indian epics, Ram was born after a lot of prayers and yagya (holy bonfire) and as he was born as the royal inheritor of Ayodhya, his birth day was a joyous occasion in Ayodhya (Uttar Pradesh, India). It was very much like a dream come true for Dasharath as the lack of an heir was a big trouble for him even long after his marriage. It is said that Lord Vishnu took the avatar of Rama when he saw the growing havoc of the invincible Ravana on earth. As it is said, when the troubles created by Ravana started increasing on earth, Lord Brahma started receiving complaints from all the gods about the mayhem that Ravana was inflicting on earth. However, as Lord had granted Ravana an exceptional boon that he could never be killed by a god, all the Gods in heaven had become helpless. However as soon as Gods realized the loophole in his boon that Ravana had not asked for invincibility from a human being, Lord Vishnu decided to go to earth in the guise of Maryada Pushottam Ram, the son of King Dasharath and Queen Kaushalya to save the earth and his devotees from the wrathes of Ravana and his unreligious measures. This great legend is known to every Indian irrespective of caste, creed and religion. Lord Rama is worshipped in the country as an epitome of an ideal man. One who is good and true and the one who is ideal in every regard – a perfect son, an ideal brother, a wonderful husband, a mighty king and a great father. He is not simply thought of a hero, but as someone who is the true representation of a flawless man. Therefore, it is no surprise that his birthday is celebrated year after year with great enthusiasm on the ninth day after the new moon in Shukal Paksh (the waxing moon), which falls sometime in the month of April. Rama Navami Pooja is held in high regards by all the Hindus all over the world. Most of the people prefer to observe a whole day fast on this day. Generally devotees prefers to be on a satvik food without salt, however there are people who also go for Nirjal fast that is fast even without water. Those who are satvik fast consume potatoes made in any form without haldi (turmeric), garlic, ginger or onion. He can also eat fruit and root vegetables of any kind. Curd, tea, coffee, milk, and water are also permitted. There is no very specific ritual to perform pooja. People visit temples and listen to stories of Ram janam (Rama’s birth) and various other legends from Ramayana. Devotees also sing bhajans praising the deeds of Lord Rama, his loyal brother Lakshmana, his devoted wife Sita and Rama’s greatest devotee Hanuman. If the pooja is preformed at home, the home is first of all cleaned properly and pictures of Lord Rama, Lakshmana, Sita and Hanuman are put on a dais in preparation for the puja. All the members of the family together worship the deity on his birthday. 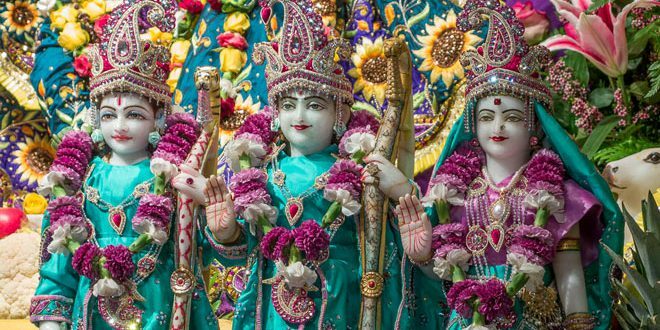 Devotees offer flowers, sweets and light diyas and incense sticks in order to please Lord Rama and his consort. Two thaalis are kept ready infront of the deities. One thali containing the prasad and the other containing necessary items like roli, aipun, rice, water, flowers, bell and conch for the pooja rituals. After lighting the diyas and incense sticks, devotees sprinkle holy water, roli, and aipun and rice on the deities. They also read out holy mantras in order to please the deity. After the pooja is done, an aarti is performed and the holy water from the pooja is sprinkled over the devotees as a sign of blessing and auspiciousness from God. The youngest female member of the family then applies teeka to all the male members of the family. At the last the holy prasad is distributed among all the people who have gathered for worship. Next What is Mission Shakti? Name the Missile & satellite used in it?